Just a quick note to update you on the Referendum held last Thurs 16th November. 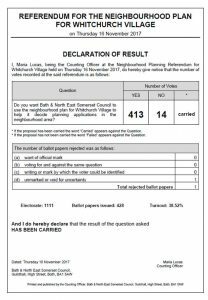 Thank you to all those who voted, please see the Declaration of Result below, with a resounding Yes vote. The next step is the Joint Spatial Plan, please come along to a meeting being held on Thursday 23rd November from 7-9pm in the Whitchurch and Pensford Royal British Legion, to find out how the proposals could affect Whitchurch Village.